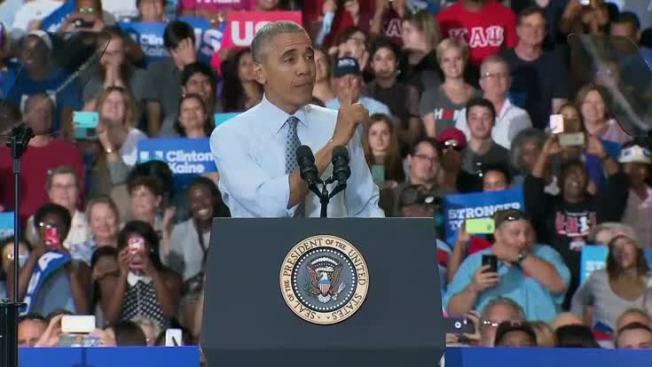 Speaking in Columbus, Ohio, on Tuesday, President Obama urged people to vote and pick up a free taco. The president's audience, full of Cleveland Indians fans, was well aware of Taco Bell's campaign giving away free tacos Wednesday because the Indian’s Francisco Lindor stole a base in game one of the World Series. The president told voters the giveaway would make an ideal post-vote snack. If you’re in the mood for a free taco this afternoon, you’re in luck. And you have the Cleveland Indians to thank for it. As part of their “Steal a Base, Steal a Taco” campaign during the World Series, Taco Bell is offering customers a free Doritos Locos Taco from 2 p.m. to 6 p.m. Wednesday, Nov. 2, while supplies last. The fast food giant said they would offer the free treat if someone stole a base during the first two games of this year’s Fall Classic between the Indians and the Chicago Cubs. When Cleveland’s Francisco Lindor came up with a stolen base in Game One, everyone became a winner. It’s the sixth time the company has done this promotion in conjunction with Major League Baseball. Taco Bell has also given away free tacos during the NBA Finals when the visiting team won a game. Celebrate Election Day with these campaign-themed cocktails, brought to you by the Underdog bar in New York City. The "Nasty Woman," a twist on the classic cosmo, and the "Bad Hombre," a verde version of the bloody mary, are sure to impress any election party guest. No purchase is required, but Taco Bell says it will deny service to anyone they believe is double dipping for the snack.